The 2013 Walleye Pollock Survey extends from the Isles of Four Mountains to Yakutat, Alaska. As the crow flies that is a distance of 2371 statute miles. By the time the Oscar Dyson reaches Yakutat the distance traveled will be over three times that distance. The survey is completed in three segments, called legs; during the first leg of the survey we traveled 3448 nmi. A nautical mile is longer than a statute mile, 1 nmi is equivalent to 1.15 statute mile. When we were surveying the waters around the Shumigan Islands we frequently encountered large schools of juvenile pollock, identified as age 1. I asked Patrick Ressler, the lead scientist on this leg, if this was a nursery area. Patrick indicated that the science team would need to go back and review the data collected on previous surveys to determine if there was sufficient evidence to make that determination. The high number of age 1 pollock is a good sign that the fish stocks are healthy. 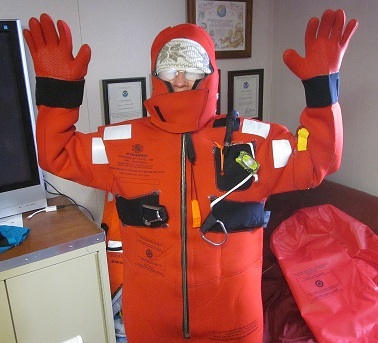 In my “Gumbi Marla” blog I talked about NOAA’s Ship Tracker and the transects, or the course, the ship navigates during the survey. Surveys are completed during daylight hours, as the pollock behave differently at night, by changing the depth at which they swim. When the acoustics data show a school of pollock that the science team wants to fish the position is recorded and the science team communicates with the Dyson’s bridge officer about when they can safely return to the specific position to trawl the area. When the bridge crew is ready to leave the current transect they contact the science team, the science team then records the time and the exact position where the Dyson left transect. After the trawl is completed the Dyson returns to the exact position they left transect to continue the survey. 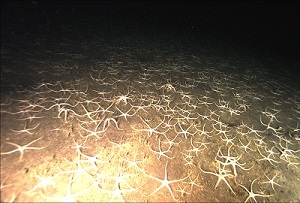 During night time hours one of the scheduled tasks was to use the camera to review areas of the sea floor that had previously been deemed “untrawlable” as the seafloor was to rocky and would snag or tear the nets. One type of gas that is trapped in Earth’s lithosphere is methane. Methane escapes the lithosphere under the seafloor through vents and along fault lines. 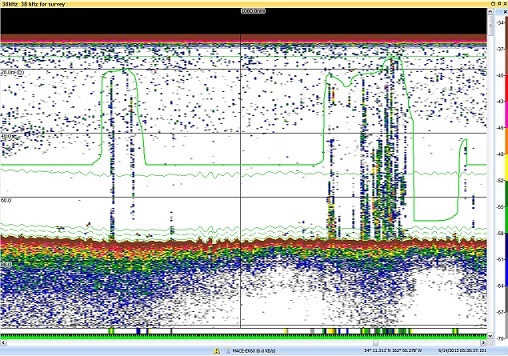 The screen shot of the acoustics monitor shows vertical columns believed to be methane. One theory about the Bermuda Triangle is a massive release of methane that creates a massive bubble. When the bubble bursts objects in the immediate area are sucked into the momentary void created by the bubble, and swallowed by the sea. Acoustic image of probable methane seepage. Trees, there are trees on Kodiak! I saw trees for the first time in 18 days, and I realize that I have missed seeing trees. It’s interesting that the first three people I talk to as we approach the island of Kodiak all ask if I saw the trees. I guess I’m not the only one that has missed seeing trees. Sometimes the simplest observation makes the biggest impression. Thank you to the crew of the Oscar Dyson and Science Team and to NOAA for giving me a phenomenal experience with the Teacher at Sea Program. Many students will benefit from my experiences. 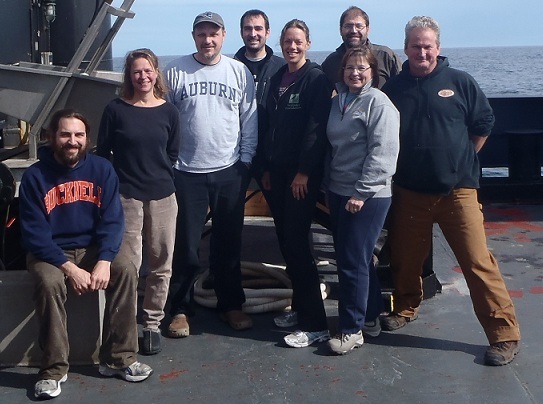 Pictured is the Science Team from Leg 1 of the Pacific Walleye Pollock Survey, from left to right: Lead Scientist Patrick Ressler, Taina Honkelehto, Kresimir Williams, Rick Towler, Abigail McCarthy, Marla Crouch (that’s me), behind me is Charles Andersen and Mike Gallagher. There were so many great experiences; I hope you enjoy the video giving you glimpses into the science, technology, sights and the Oscar Dyson. Thanks to everyone that made my experience possible! Cam Trawl, Critter Cam, Drop Cam, Trigger Cam (dubbed “the contraption”), and a camera that will be used on Acoustic Vessel of Opportunity (AVO) project, are different camera systems scientists are testing and using on this leg of the pollock survey to help monitor the biology in the region. Each camera is designed for a specific application. Cam Trawl is attached immediately before the codend of a survey midwater trawl net, and takes pictures of the fish swimming by. 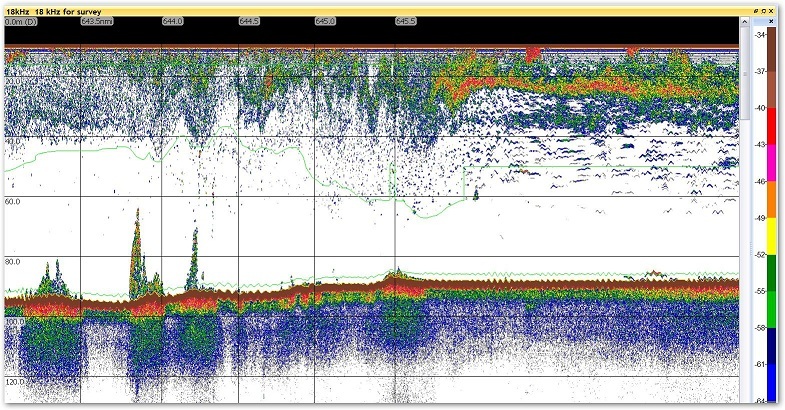 Cam Trawl allows scientists to look at what depth the fish were captured, and use this information to help identify specific fish echoes on the sonar graphs. 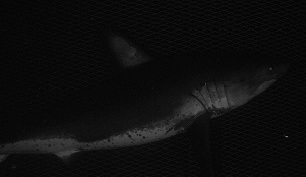 In one of our trawls, we were able to see pictures of a female Salmon Shark entering the net. She was quickly measured and released. 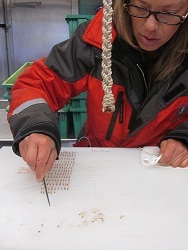 Critter Cam is attached to the survey net on the Oscar Dyson and takes pictures of little critters, like krill and different types of plankton, that are too small to be captured in a trawl net. juvenile smelt. Pictures provided by NOAA. 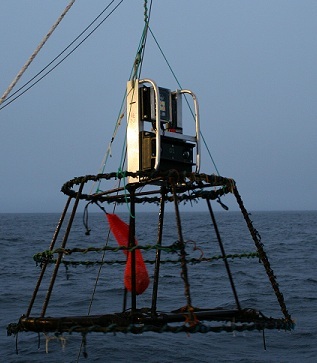 The Drop Cam is a tethered stereo camera that is lowered to take pictures of the sea floor. This instrument is going through a series of sea trials on this cruise, where the lights, exposure, and battery life are all being tested and fine tuning adjustments are being completed. Battery life is a concern, as both the cameras and the lights require energy to operate, and the scientists want to maximize the amount of time data is being collected . 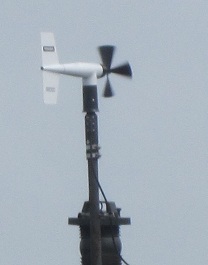 In order to conserve energy a depth sensor trip switch was added that turns the system on at 15 m depth. 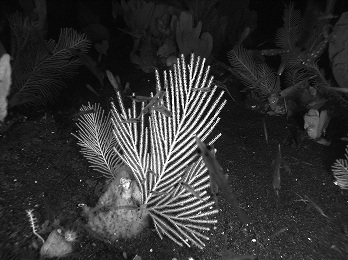 This addition allows the camera to continually take 10 pictures a second for a longer time on the sea floor. 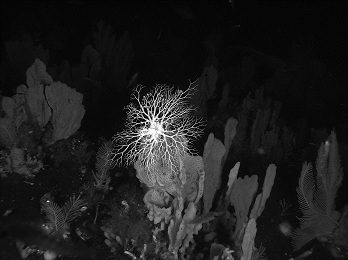 After this cruise the Drop Cam heads west to help survey the coral reefs west of the Islands of Four Mountains were we started our pollock survey heading east. Yes, there is coral in the cold waters of the Gulf of Alaska and the Berring Sea. 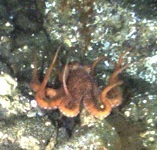 Brittle stars. Picture provided by NOAA. 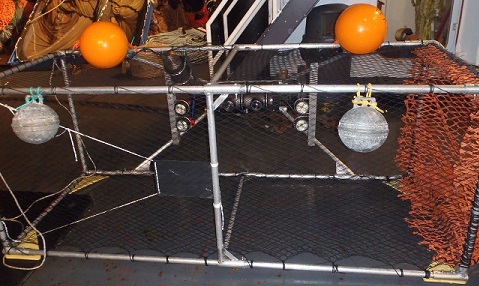 Trigger Cam, which the Dyson’s crew has dubbed “the contraption”, is attached to an anchor and lowered to the sea floor. The anchor we are using is a sablefish pot (a trap that is normally used to catch fish on the bottom), which has a buoy line attached, and the buoy marks the location of the camera on the surface. 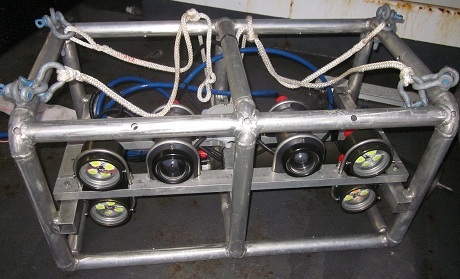 There are six Trigger Cams in development; the concept is that the cameras are deployed in a series a few nautical miles apart and left for 3 to 4 hours before retrieving. To conserve energy, this piece of equipment is designed with a motion sensor. An infared camera (fish cannot see infared light) runs at very low resolution (produces a blurry picture, as the water is in constant motion). 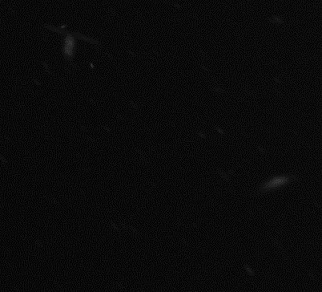 When something, such as a school of Pacific cod, swims by, the motion is detected, camera flashes are triggered and a high resolution (clear) picture is taken. When the Trigger Cam system is fully operational, scientists hope to collect more in-depth evidence about the fish population in the deployment areas. Deployment of the Trigger Cam. AKA The Contraption. Picture provided by NOAA. School of Pacific Cod taken by Trigger Cam. Picture provided by NOAA. The AVO Cam is designed to attach to a survey bottom trawl net and take picture of the fish passing through, without being caught. There are two cameras (stereo) mounted so that field of vision intersects at a specific distance. The two cameras and the point of intersection can be used in a process similar to triangulation that allows the length of the fish swimming through to be measured. The stereo photography process is the same technology that is used in the making of 3D movies. The AVO Cam will be used in a survey that is carried out onboard chartered commercial fishing vessels (“vessels of opportunity”). Readying the AVO camera for sea testing. 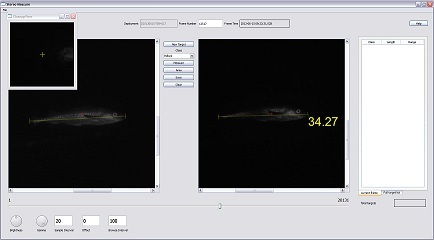 The stereo camera data is input into measuring software, which calculates the length of the fish in cm. Screen shot provided by NOAA. I enjoy listening to the various conversations that the scientists have about what they are seeing on the sonar displays and in the pictures, how the equipment is being used, when data are inconclusive the hypothesizing about the phenomena, and the time need to complete the different science studies. There is only so much time. Today’s conversation revolved around the need to hide from the weather! 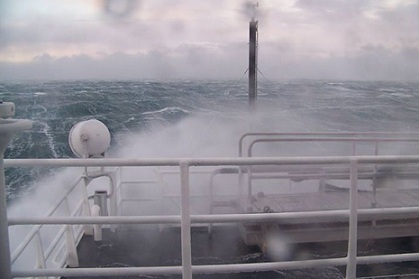 An area of low air pressure is forecasted to kick up a gale force storm, and the safety of the ship, crew and science team is an important consideration in our travels. With this in mind, the Commanding Officer of the Oscar Dyson and the science team are looking for areas of safe harbor where we are sheltered from the worst of the storm and can still do science work. I wonder will we be on the lee side of an island, in a bay or fjord? Time will tell. 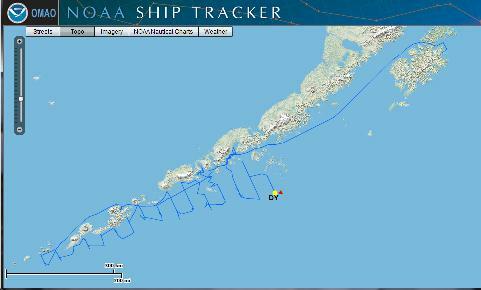 To date we have traveled 2670.50 nmi since leaving Dutch harbor. The Oscar Dyson is harbored in Captains Bay and there is much to do aboard before we set sail on our cruise. Some equipment needs to be off loaded and stored while other equipment needs to be loaded and secured. 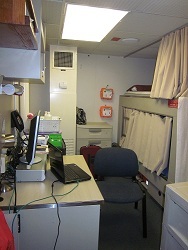 The Science Team checks their berth (room) assignments, drop off their gear, and begin the task of readying the equipment. “What are the properties of sea water?” Are you thinking liquid? There are three properties that scientists routinely check, they are temperature, salinity and density. The Dyson’s crew deploys an instrument referred to as the CTD. 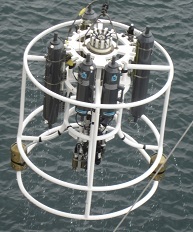 The CTD contains sensors which continuously measure the Conductivity, Temperature and Depth of the water. 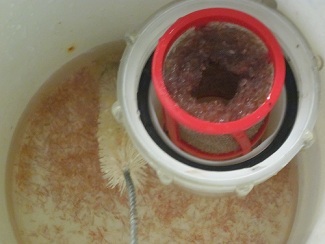 The CTD is sent to the bottom to create a profile of the temperature and salinity (as measured by how well the water conducts electricity or its ‘conductivity’) and then is brought back to the surface. On the way back up water samples are collected at per determined depths, in the grey bottles. The collected water samples are measured to calibrate the sensors on the CTD. This information is then used to calibrate the sonar. Sonar uses sound waves called pings that bounce off objects creating echoes. The echoes are recorded and used to create pictures of the sea floor and other object, such as schools of fish. To calibrate the sonar a round shiny ball that reflects the pings is submerged beneath the ship. The scientists know the expected strength of the echo from the sphere given the water temperature and salinity, allowing them to calibrate the sonar. Sometimes fish interfere with the calibration process. Fish are curious creatures and want to investigate the shiny sphere, getting in the way of the pings and slowing down calibration. When the calibrations have been completed we set sail. As the Dyson sailed out of Captains Bay, we encountered dolphins jumping out of the water and whales surfacing. Perhaps they were feeding on the large school of fish seen in the sonar. 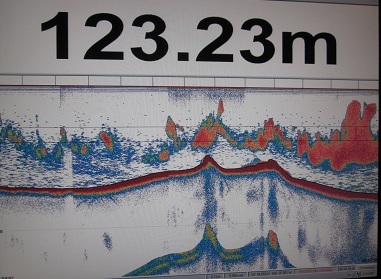 The sonar shows the sea floor, the band of blue, yellow and red. The schools of fish are the pink groupings. The water depth is 123.23m. Before leaving Seattle, I was told my luggage might not be on the same flight as I was on into Dutch Harbor. The airport in ‘Dutch’ has a short runway and is serviced by turbo prop aircraft that seat 33 passengers. When I checked in, I was asked for my weight and any carry-on. The airline uses the total loaded weight of the aircraft to calculate how much runway is needed to take off and how much fuel is needed to reach the next refueling point. Upon boarding the plane, the passengers were told that 87 pounds of luggage would not make the flight and more than likely the bags would be on tomorrow morning’s freighter– weather and volcanic activity permitting! I kept my fingers crossed that my bag was in the cargo hold. A little over an hour into the flight, we landed in King Salmon for refueling. Shortly after landing, we were once again airborne for the 1 ½ hour flight to Dutch Harbor. In route along the volcanic chain of Aleutian Islands, you can see peaks visibly venting steam and Mt. Pavlof’s snowy surface is blackened with fresh ash. The Oscar Dyson will sail past several of these active volcanoes. Looks like I’ll be adding a volcanic eruption to my list of “want to see” while aboard the Dyson. I am also hoping to see the Aurora Borealis and pods of Humpback and Orca whales. Landing at Dutch Harbor I realized why weather is a crucial factor for safe touch downs. A section of Mt. Ballyhoo has been blasted away to make room for the runway. Peering out the window, one gets the feeling that the tip of the wing is barely whisking past the face of the cliff. On the other side of the runway is the water of Iliuliuk Bay. Good news, my luggage and I landed at the same time! 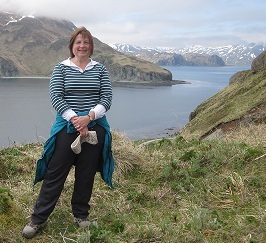 Dutch Harbor attracts many bird watchers, as bald eagles, puffins, rock ptarmigans and other birds are abundant here. 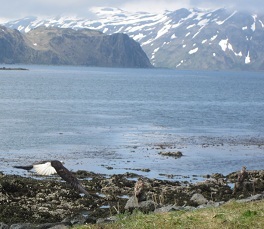 Juvenile bald eagles are dappled brown and white and blend into the rocky shore and crags of the steep cliffs. 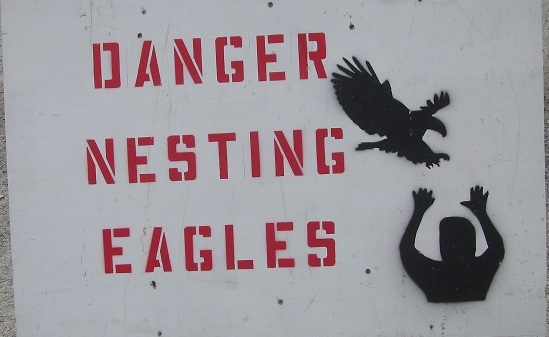 This time of year, signs warning of nesting eagles are also abundant. As birds tend to use me for target practice I am very mindful of the warnings. Thankfully, I was not dive bombed by any eagles or other birds! and two juveniles. Can you find all three? Before boarding the Oscar Dyson I visited the Museum of the Aleutians. The exhibits feature information about life and culture in the Aleutians and how WWII impacted the people. 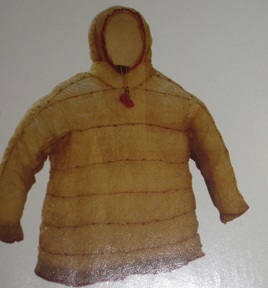 One of the displays featured several handmade parkas constructed from the gut (intestine) of seals and walruses. The material is both light weight and water proof. Just south of the museum is Bunker Hill towers above Dutch Harbor, and one can still see the zigzag pattern of the WWII trenches etched into the landscape. 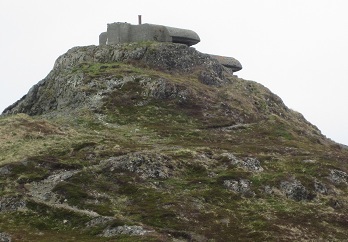 There is a trail to the bunker atop the hill; I think I’ll go for a walk. Almost to the top of Bunker Hill about 700 feet above Dutch Harbor the panoramic vistas of Captains Bay, Dutch Harbor and the City Unalaska are spectacular. Taken about half way up Bunker Hill. The Gulf of Alaska helps to generate much of the seasonal rainfall along the west coast of British Columbia, Washington, and Oregon. The strong surface currents, as high as 1.7kph (1.9mph) in the southern reaches combine with the cold arctic air to create these weather systems that affect our weather and climate.